Mom says it’s time for Hattie to get a haircut, but Hattie refuses, declaring that she will “never, no way, not at all” let anyone cut her hair. She falls asleep wishing that her hair never stops growing– but soon regrets her wish! Her hair grows so long that kids jump rope with it and birds nest in it. When she wakes up, she not only changes her mind about getting her hair cut, but she finds out that she can do a good deed in the process by donating her hair to Locks of Love. 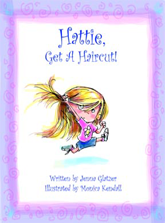 Lyrically written and whimsically illustrated in full color, Hattie, Get a Haircut! is sure to delight children and parents alike. Is your child afraid to get a haircut? Let Hattie help your child get past the fear and into the hairdresser’s chair. 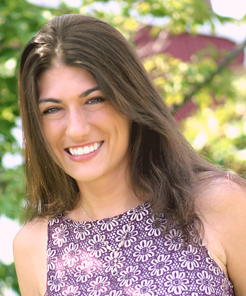 Jenna Glatzer is an award-winning full-time writer in New York who’s written hundreds of articles for magazines and online publications such as Prevention, Woman’s World,Woman’s Own, Physical, Women’s Health & Fitness, Salon.com, ePregnancy, and AOL. She’s also a contributing editor at Writer’s Digest. She is the editor-in-chief of AbsoluteWrite.com, a produced playwright, optioned screenwriter, and author of hundreds of greeting cards. Her latest books include The Street-Smart Writer (Nomad Press, 2005) and Fear is No Longer My Reality (McGraw-Hill, 2004), co-written with Jamie Blyth of The Bachelorette. Her next book is Celine Dion’s authorized biography. She is also an instructor at the Omega Institute in Rhinebeck, NY. Monica Kendall, an award-winninganimator with Calabash Animation(Keebler Elves, Trix the Rabbit, Lucky Charms Leprechauns, California Raisins, just to name a few), has been drawing livelycharacters since she was seven. A graduate of the Art Institute of Chicago, she has created and produced many animated shorts,including music videos (Billy Joel) and animated films (How the Elephant Got Its Trunk). Monica lives outside Chicago with her husband and fellow animator, Ed Newmann, and their daughter Natalie. …Or ask for it at your local bookstore! Jenna is available for interviews (radio, print, Internet, or TV), school appearances, and camp appearances.